Internal stresses confronting individual officers." Policing is a highly demanding work environment with the threat, uncertainty at work, encounters, political pressure, exposure to violence, and death. "Research suggests that the suicide rates among police are at a higher rate than other groups and also demonstrates high rates of divorce and reduced quality of family life among police. The findings from the studies showed that," 23% of male and 25% of female officers reported more suicidal thoughts than the general population (13.5%). "An evidence is essential for the interventions as it's an important and necessary component to help police deal with the stressors and their health" as hardly any research conducted on the occupational problems of police as far as our knowledge. We look forward to address the issues that arise from this research, to come up with some effective interventions and provide recommendations to reduce occupational related distress among police. Police occupational stress is an extensive issue due to number of negative consequences on an individual as well as the police department, which is often neglected. This study is the first of its kind in Udupi District. The objectives of the study were to: (i) to find out psychological distress among police constables of Udupi taluk, (ii) to assess the most stressful occupation-related activities and (iii) to examine the factors influencing psychological distress. A cross-sectional study was conducted from June to August 2014 among police constables. Seven police stations were randomly selected from a total of 11 stations in Udupi taluk. A list of all police stations in Udupi taluk and permission to conduct the study was obtained from the superintendent of police, Udupi district. From each selected police station constables, who were available and willing to participate at the time of data collection were included. The study sample comprised of 76 police constables. A predesigned, pretested, self-administered, structured questionnaire was used for data collection, which was administered in both English and Kannada languages. Questions were asked on the background characteristics on habits (smoking, smokeless tobacco, and alcohol), history of any diseases, and sleeping problems. Psychological distress was measured using the general health questionnaire (GHQ-12), which is a self-administered screening tool designed to detect psychological distress. It consists of 12 items which describe mood states, six of them are positively framed and the remaining was negatively framed. Each item of the scale has four possible options, which are 0 - better than usual, 1 - same as usual, 2 - less than usual, 3 - much less than usual. Based on the scores, the psychological distress was classified as no distress (scores <15), moderate distress (scores 15–20), and high distress (scores <20). The stressors were measured using organizational and operational police stress questionnaire (PSQ-Org and PSQ-Op), which is a Likert scale and ranges from "no stress at all" to "a lot of stress." Mean with a standard deviation (SD) of each of the stressor was calculated. Willingness to participate in the study was obtained in the form of written consent from the participants. Confidentiality was guaranteed and involvement was voluntary. Data were entered using Statistical package for the Social sciences (SPSS) version 15.0, Chicago Illinois. Results were tabulated using frequency distribution and proportions for dichotomous variables and mean with SDs for continuous variables. Association between psychological distress and other variables was studied using Chi-square test, with P< 0.05 considered as being significant. The study samples comprised of 76 police constables. 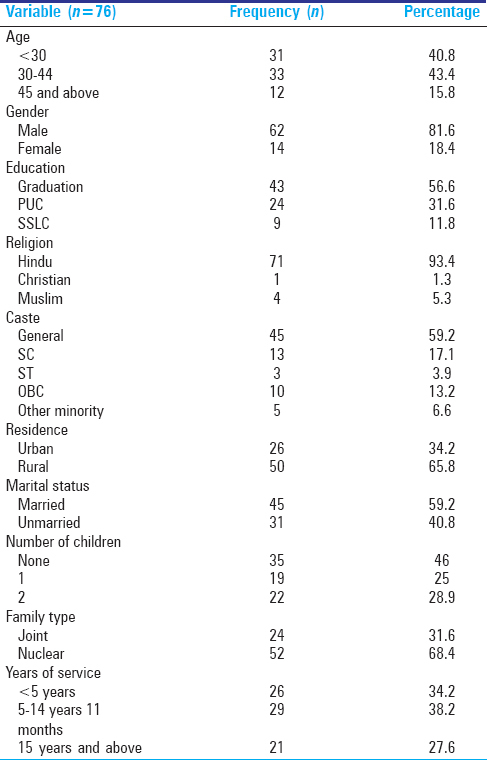 [Table 1] depicts the socio-demographic details of the participants. Majority of the participants (84.2%) were<45 years of age. About 82% were males and more than ½ (56.6%) were graduates. With respect to religion, maximum (93.4%) number of the participants followed the Hindu religion. As depicted in [Table 2], 10 participants had a history of indulging in at least one of the habits (i.e., smoking, smokeless tobacco, and alcohol). One-tenth (10.5%) of the participants reported of having one of the chronic diseases (diabetes, cardiovascular disease, migraine, gastric problem, and psychological illness). Nearly, 13% of the participants had disturbed sleep pattern. One-fourth (95% confidence interval 0.153, 0.347) of the participants had high psychological distress as per the GHQ. The various stressful activities with their mean and SDs are depicted in [Table 3] as per their rank order. Overall, out of 40 sources of stressful activities, 28 came out to be significantly associated with psychological distress. 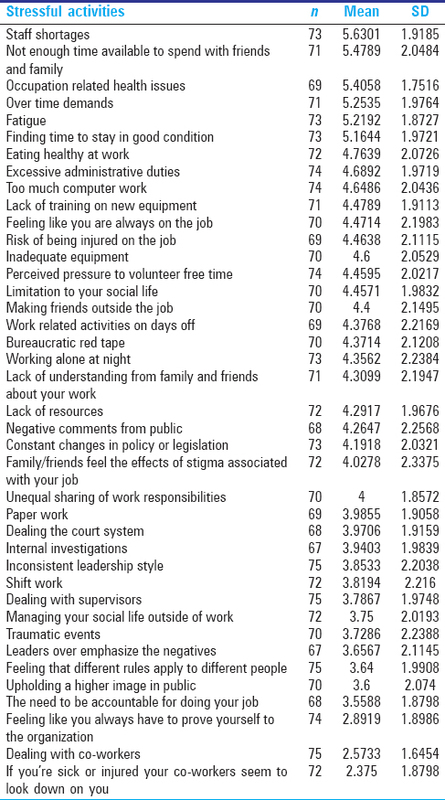 The top six are depicted in the [Table 4], other stressful activities, which came out to be significant were: Risk of being injured on the job (P = 0.007), paper work (P< 0.001), eating healthy at work (P = 0.033), lack of understanding from family and friends about the work (P = 0.013), making friends outside the job (P = 0.006), upholding a higher image in public (P = 0.008), limitation to social life (P = 0.015), feeling like being always at job (P = 0.033), loved ones feel the effects of stigma associated with job (P = 0.023), feeling that different rules apply to different people (P = 0.011), excessive administrative duties (P = 0.044), constant changes in policy and legislation (P = 0.033), bureaucratic red tape (P = 0.002), too much computer work (P = 0.013), lack of training on new equipment (P = 0.006), perceived pressure to volunteer free time (P = 0.008), dealing with supervisors (P< 0.001), inconsistent leadership style (P = 0.011), lack of resources (P = 0.009), internal investigations (P = 0.009), need to be accountable for doing work (P = 0.024), and inadequate equipment (P = 0.003). The present study intended to find out the prevalence of psychological distress among police constables, assess the stressors, and the factors influencing it. In the present study, about one tenth of the participants reported of having at least one of the chronic diseases and 13% were indulging in one of the habits. In a study done by Selokar et al., 18%, 6%, and 2% reported of having hypertension, diabetes, and tuberculosis, respectively, and three-fourth were addicted to tobacco use. In the present study, 21% of the participants reported of having moderate psychological distress, 25% as having high levels of stress, while a study conducted by Selokar et al., Kaur et al. and Rao et al. reported moderate and high levels of stress to be 67%, 35%, and 73%, respectively. In another study done by Sundaram et al., among female constables in Tamil Nadu, 33% and 42% of the participants reported as having high and very high-stress levels, respectively. The top five stressful activity in the present study was "staff shortages," "not enough time available for family and friends," "occupation-related health issues," "over time demands," and "fatigue" with a mean of 5.63 (1.92 SD), 5.48 (2.05 SD), 5.41 (1.75 SD), 5.25 (1.98 SD), and 5.22 (1.87 SD). Study conducted by Sundaram et al. reported the mean of "staff shortages" to be 4.57 (2.62 SD) and "overtime demands" having mean of 5.19 (2.15 SD). In another study done by Suresh et al., "overtime demands" and "lack of time to spend with family" were the topmost stressful activities. In the present study, years of service (P = 0.004) was significantly associated with psychological distress, on the contrary study done by Naik, reported no association. In the present study, all the other socio-demographic variables, habits, and diseases were not associated, study by Kaur et al. provides evidence to the finding. In other studies conducted in India and elsewhere, the factors which were significantly associated with psychological distress were age, marital status, education,, number of dependents, habits. 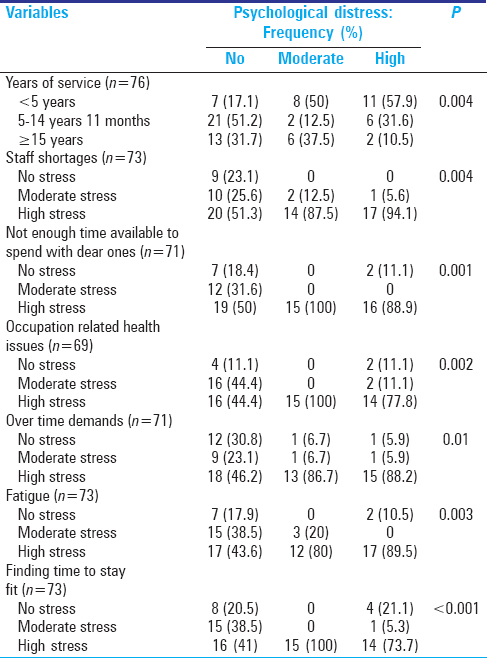 The stressful activities which were significantly associated with psychological distress were no time for family and friends (P = 0.001), over time demands (P = 0.01), inadequate equipment (P = 0.003), and staff shortage (P = 0.004) in the present study, these results were consistent with the findings of Suresh et al. Over time demands was also found to be significant in the study by Selokar et al. and Collins and Gibbs. This study intended to find out the prevalence of psychological distress among police constables, assess the stressors, and the factors influencing it. More than two-fifth of the participants were facing some levels of stress. The present study indicates that most of the sources of stress were related to the workplace specifically staff shortages, lack of time for family and friends, occupation-related health issues, over time requirements, and fatigue play an important role in influencing psychological distress. Hence, modifications such as sharing work, fixed duty hours, etc., should be done in the police department in order to avoid stress and its adverse effects. Stress management training can be given at regular intervals to improve competitiveness and enhance coping skills. Since this study is the first of its kind to be conducted in Udupi taluk, more intensive and in-depth research can be carried out. We would like to extend our deepest sense of gratitude to the Superintendent of Police, Dr. Boralingaiah, and Police constable, Mr. Shivanand B, Udupi district for their co-operation and support throughout the study period. We are thankful to all the participants for sparing their valuable time and taking part in the study. Police Stress. Available from: https://www.soc.umn.edu/~samaha/cases/police_stress.htm. [Last cited on 2014 Sep 26]. Baker L. Researchers Investigate Impact of Stress on Police Officers' Physical and Mental Health-University at Buffalo. University at Buffalo, the State University of New York; 2008. Available from: http://www.buffalo.edu/news/releases/2008/09/9660.html. [Last cited on 2014 Sep 26]. Sánchez-López Mdel P, Dresch V. The 12-Item General Health Questionnaire (GHQ-12): Reliability, external validity and factor structure in the Spanish population. Psicothema 2008;20:839-43. Shane JM. Organizational stressors and police performance. J Crim Justice 2010;38:807-18. Selokar D, Nimbarte S, Ahana S, Gaidhane A, Wagh V. Occupational stress among police personnel of Wardha city, India. Australas Med J 2011;4:114-7. Kaur R, Chodagiri VK, Reddi NK A psychological study of stress, personality and coping in police personnel. Indian J Psychol Med 2013;35:141-7. Rao GP, Moinuddin K, Sai PG, Sarma E, Sarma A, Rao PS. A study of stress and psychiatric morbidity in the central industrial security force. Indian journal of Psychological Medicine 2008;30:39-47. Sundaram MS, Kumaran MJ. A study on frequency of stress among female police constables reference to Tamilnadu police department, India. International Research Journal of Social Sciences 2012;1:15-20. Suresh RS, Anantharaman RN, Angusamy A, Ganesan J. 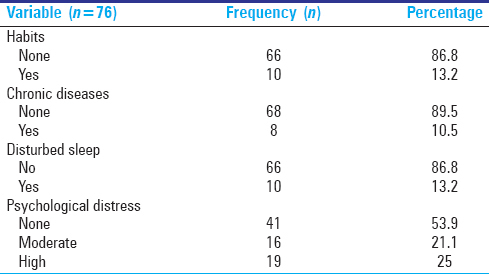 Sources of job stress in police work in a developing country. Int J Bus Manage 2013;8:102. Naik KD. Stress among police : A case study on the police personnel at waghodiya, panigate and airport road police station in Vadodara city. Indian Journal of research 2012;1:47-51. Collins PA, Gibbs AC. Stress in police officers: A study of the origins, prevalence and severity of stress-related symptoms within a county police force. Occup Med (Lond) 2003;53:256-64.